Originally published in 1902 by Henry O. Harden’s newspaper publishing company, History of the 90th Ohio Volunteer Infantry tells its story through the soldiers’ personal letters, diary entries, and memoirs. Formed in response to Confederate maneuvers in Kentucky in 1862, this regiment was comprised of men from Fairfield, Fayette, Hocking, Perry, Pickaway, and Vinton counties. They served in the Civil War from 1862 to 1865 and spent much of their time in Tennessee bravely participating in such battles as Stones River, Tullahoma, Chickamauga, Resaca, Kennesaw Mountain, Atlanta, Franklin, and Nashville. 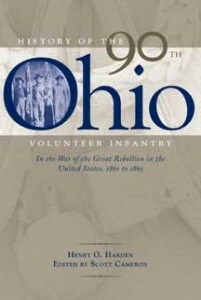 History of the 90th Ohio Volunteer Infantry contains the memories and voices of the men who served in this unit. Asked to reflect on their experiences nearly 40 years after their service, these men recalled the miles they marched, the friends they made and lost, the hardships they suffered, the fear they felt, and the jokes they enjoyed. Harden covers the entire life of this regiment, from the formation and early days to the fate of every member at the close of the war. With its primary-source descriptions of battles, miscellaneous stories and poetry, and listing of every member and his fate, this book will be welcomed by those interested in the Civil War and the role Ohio played in it. Henry O. Harden served as a private in Company G of the 90th Ohio Volunteer Infantry during the Civil War. After the war he was the publisher of the Fairfield-Pickaway News. He used his newspaper as a newsletter for the veterans of his regiment, asking them to send him their stories. He served as president of the 90th Ohio Veteran’s Association until his death in 1917. Scott Cameron is the great-great grandson of Henry O. Harden. He resides in Rockbridge, Ohio.